WORLD'S LARGEST Wood Pellet Stove ... buy it and SAVE $$$$! 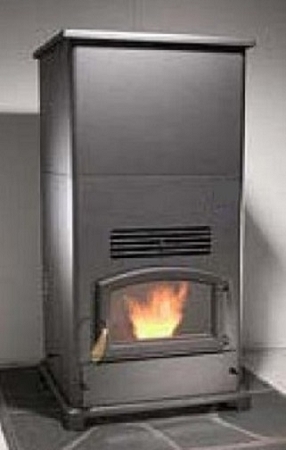 The Jumbo Wood Pellet Stove is the largest wood pellet stove made in the world. You can load up the hooper bin with 7 bushels of pellets and let it run, run, run, run. A 350 lb hopper bin when expanded two pieces one on top of another will make it 350 lbs. It will run 7 times as long as other pellet stoves before re-fill time. You can put it in any size of home, garage, farm house, business at 1,500 sq. ft. to 2,500 sq. ft. and even business shell buildings up to 2500 sq.ft. It has up to 55,000BTU/HR and will heat almost any size space you have. It has Auto-lite, thermostat control capability, and POWER-OUTAGE capability. Manufacturer offers a 3 YEAR MANUFACTURER'S WARRANTY. Be carefull from whom you buy! This unit retails at a manufacturer's recommended selling price or MRSP of $2,550.00. Supplies are limited and there are only a few left in the warehouse for this heating season. It is still wise to buy one now and get it delivered and installed this fall/early winter so you don't miss any remaining cold months this heating season. Every month of delayed decisions with cost you $250 to $350 per month in heating bill savings. The manufacturer has only built a limited number. Get your wood pellet furnace (stove) purchased now. The OPTIONS Available: (1) Ash Pan at the Bottom $100, (2) Hopper Bin Extension to 350 lbs (no charge), (3) Hookup to Ductwork $945 more (see last picture 3rd row at bottom), (4) Upgraded Multi-fuel Model (same as (3) will burn multiple fuels corn, wood pellets, etc., add $945, (5) Flue Exhaust Kit add $365, (6) Flue Extention 6-Foot Up-the-basement-Wall add $150, (7) Fresh-Air Kit add $145, (8) Digital Thermostat add $68, (9) Remote Thermostat add $225, (10) Hot-ASH Vac $249, (11) POWER-OUTAGE Module $179. We can arrange a special buy-it-now for these OPTIONS to avoid circumvention of Ebay fees. At a low particle emission rate of 2.19 grams/hr this unit meets or exceeds the EPA Certified Phase II Emissions Standards at 7.5 grams/hr for non-catalytic wood stoves and 4.1 grams/hr for catalytic wood stoves. Wood pellet stoves are non-catalytic. It also meets or exceedsColor=red> the strict CALIFORNIA Standards, COLORADO Phase III Approved, state of WASHINGTON Standards (less than 4.5 g/hr. ), and the strict OREGON Standards (less than 2.5 g/hr) for particle emissions. Optional Thermostat Control is available and it may be run with or without thermostatic control. This is a new feature never before offered as a standard. The stove (furnace) can be setup to run on either automatic or manual mode. In automatic, when the thermostat shuts off, and does not call for heat, the auger or heat range speed go down to the lowest setting of 1. If the temperature inside (outside) the house falls, then it will re-set to the heat range setting prior to being reduced. We sell Wall Thermostats Round or Square, Wall Dial-Indicator Thermostats, and Remote Control Thermostats. The demand for wood pellets stoves have skyrocketed with Corn and Ethanol impact and gas fuel costs going up 25-50% this winter. The Farmer's Almanac has forcasted a very COLD winter, and they're usually right. The price of wood pellets are not expected to increase this winter at $4.50 to $6.50 per 40 lb bag. The costs to operate a stove will be 1/6th to 1/8th natural gas, propane gas, and fuel oil.. $4.50 per Bag will heat a 1500 square foot home one day or and average of $135.00 per month. That beats a $600.00/month Natural Gas bill by a long shot! There is a 3 YEAR WARRANTY on the heat exchanger, combustion chamber, fire box, door, etc., and 1 YEAR WARRANTY on electronics. Be careful from whom you buy. We are a Dealer specializing in wood pellet and corn stoves and can help you through your installation as well as and trouble shooting if necessary down the road. Be careful as others do not have the capability to do that. Winning bidders will be immediately mailed our 24 page OWNER'S MANUAL so they may read it and prepare for the future delivery of their Corn furnace (stove). In the Owner's Manual is a step by step instruction. Also installation for Exhaust Flue Vent Kit (not provided) and startup are provided. Exhaust Flue Vent Kit can be purchased separately at your request and/or check our Ebay Store. The unit is assembled in a box/crated pallet. You can pickup or have it shipped. STANDARD SHIPPING is by a commercial freight carrier 500 lbs to the nearest large-city Main Terminal serving the customer's geographic area. There are several terminals in each state. Customer just picks up at this regional Main Terminal. You just drive down (over) there in a pickup truck and they will load your unit into your truck with a forklift truck. If your place of employment has a liftgate and/or loading dock we could ship there. For another small charge we could also ship to a local forklift-loading dock business in the same or nearby town. Customers requiring liftgate residential service (not normal shipping) should expect a significant add-on charge. Note shipping companies now categorize farms and rural areas as residential delivery requiring an extra charge. Check for DAMAGE BEFORE you accept or remove merchandise. Standard procedure for pickup is to check for damage, examine the carton, box, skid for damage, if damaged NOTE it on the SIGNATURE FORM, otherwise your CLAIM will be DENIED. Note shipping companies will try to get you to sign FREE and CLEAR without noting exception on the delivery form or slip. If you sign CLEAR without noting damages, your claim will be DENIED. Excessively damaged items just reject and leave at the terminal.